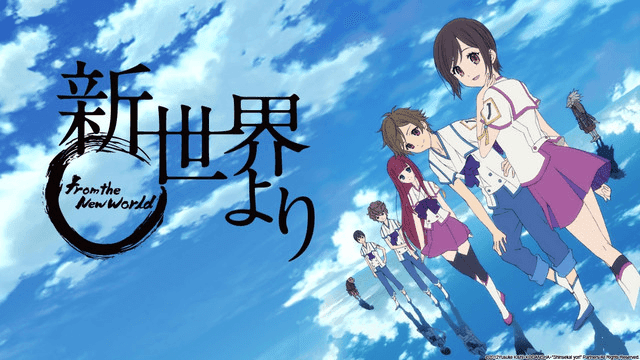 The anime Shin Sekai Yori (From the New World) present us a world with strong and ancient rules where certain humans, developed powerful mental abilities (since moving objects to human cell manipulation).
" 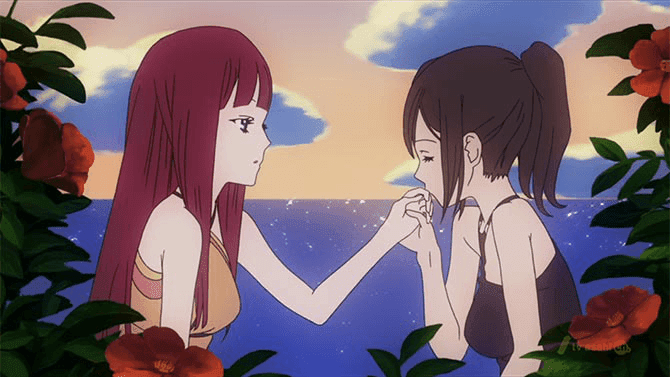 From the New Memories"
I follow some blogs and there is one in particular that each year performs a post about the best anime of the year (in several categories), this blog is Random Curiosity! So, as usual, my expectations were very high because this anime escaped me when I analyzed the lists of anime for 2013. Shin SekaiYori surprised me a lot in the opening, because it has none! Abdicating the opening they gave one-minute more for story (this in 25 episodes results in 25 minutes, which mean an extra episode). On the other hand, they produced two endings. The first one much better than the second (I start to think it's tradition I like more the first song of each anime :P)! An ending that I enjoy, what is very rare! In 2013's animes only Danganronpa manage to do that (2 good endings in 20 anime seen). This ending really reflects the very dark elements that there are in Shin SekaiYori and it’s a nice way “to cut” the climax of the episode. Before you decide to watch Shin SekaiYori (case you haven’t seen it yet) you need to be prepared. The score that I gave it is probably a little lower that it should be. Because I watched 2 or 3 episodes very late after work and I wasn’t in a very good mental shape! To understand the complex world of Shin SekaiYori you need to think and be prepared to his awful time transitions! This anime have a concept which generally is not used. The concept I'm talking about is character's evolution through time. If my memory is right, I only saw two anime who use that concept: Dragon Ball (through several seasons) and Naruto (only a two years leap). 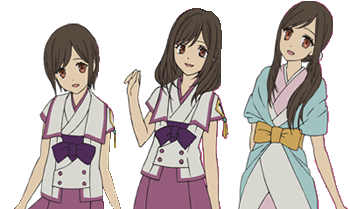 In Shin SekaiYori we are invited to follow the life of Saki Watananbe and her friends (Saturo, Maria, Shun, Mamoru and Reiko) from her childhood to adulthood (12, 14 & 26 years old). But not everything is perfect in this anime, with a complex plot is odd for me to see a poor animation (still way better than Aku no Hanna) even more by A1-Pictures (Working, Fairy Tail, Sword Art online, etc…), from the powerful humans to the monster rats everything seems unfinished. 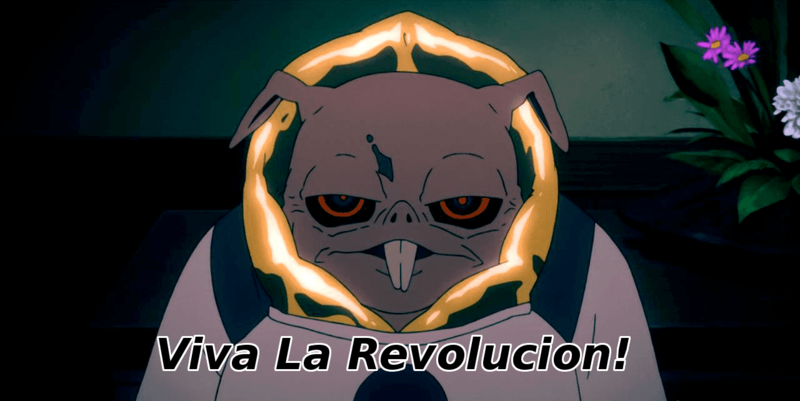 The problem of poor drawing follows the entire anime from the monster rats and humans to some mutant’s monsters that randomly appear in the anime. Taking the expression one picture is worth a thousand words, bellow there is an image of a scary monster from Shin SekaiYori world! 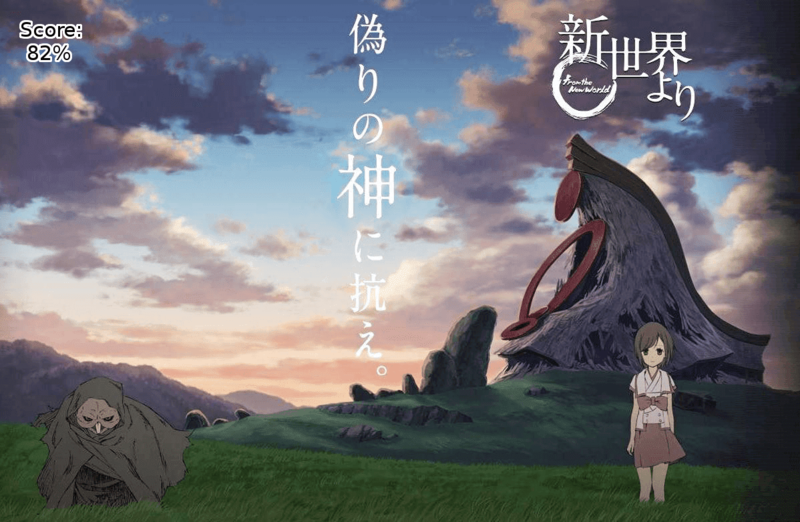 Shin Sekai Yori – another scary monster! This anime had a serious problem in the transitions, there are moments that the climax of the previous episode disappears without any apparent logic. They explain (later) what happened and why they do it like that, but it’s a very risky move, because people stay in complete confusion (that could lead to a dropout). Sincerely I stayed so confused that several times I had to check if I was watching the correct episode or if I was watching something out of order. The major problem in this is that it’s only explained in the very end of the anime, as I write before this is a major risk who can lead to people to give up of a good anime! This is an anime that is worth to see even the boring scenes (this is subjective, I enjoyed but I accept that some people can consider them boring). The two first arcs are completely overcompensate by the third arc! To avoid an unnecessary spoiler of the third arc I am not going to write many thing but is mandatory that I refer some! 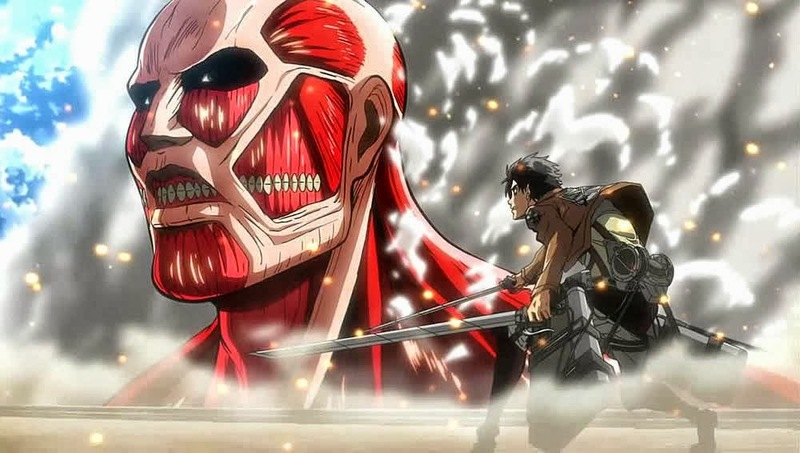 The third arc is an arc where all the human characteristics of fear, arrogance, stupidity, superiority, despair are show in a perfect level, if the animation was good this anime would be perfect. This anime left me undecided about whom to support (my decisions are generally different of common sense). Until now there was only one anime who managed to do that (Death Note)! 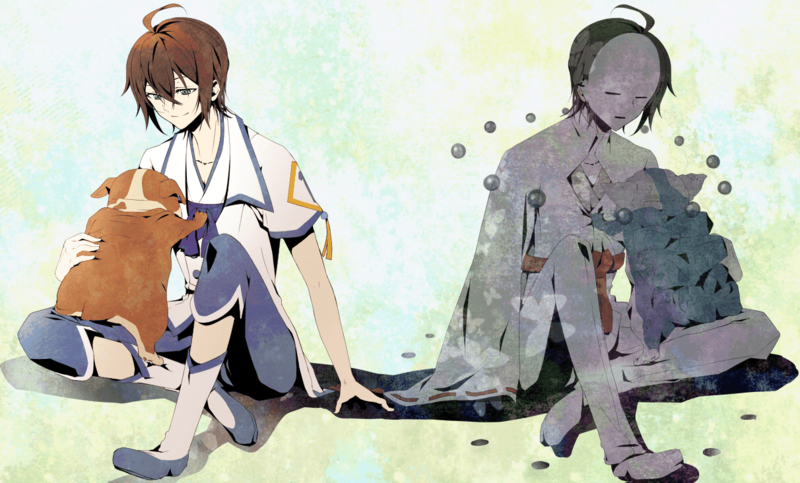 In Shin Sekai Yori all hell broke loose in the final arc. A total war between several factions, which result in an unlikely hero (for me, villain or terrorist for others) and that hero is called “el comandante” Squealer! Warning: MAJOR SPOILING in the next PARAGRAPHS! Why this title? Because of the Squealer's statement! (a statement later corroborated by Saturo). And why Squealer make that statement? Because Saturo found out (illegally) that the Monster Rats's genes had a human chromosome. Basically, humans with powers, to overcome their limitation of "death by shame", mutated an entire race, originating the Monster Rats. By controlling the Monster Rats, they can rule the "normal humans". and prevent rebellions which could result in their own deaths. This is an anime that you love it or hate it! It had a great plot and some great moments, moments that transcend the crappy animation presented! This show makes us think, it reflects much of true reality, but unfortunately A-1 Pictures studio presented the anime, in my opinion, as an experiment project! There are content to a second season, but sincerely I don’t believe that they will make it. Questions like “What is the future of this civilization?”, “why the death sentence to Mamoru?” and “can Saki change the society?” will never be answered without a second season. And why only the weak are target by the committee? The Ogre explanation is not a reason. It appeared to me that it could be any person, independently of their level of power, that could turn into a despicable Ogre. This question also is not going to be answered! And in a very rare thought by me, I prefer instead of a second season a decent remake and a better animation for this show, because it deserves and if they do it, this anime probably will enter in top 5!